Just back from my work place I heard a news on FM, “SLC result 2065” is out and record high 68% passed this year. At the back of my mind a thought struck “Oh! my cousin sister also gave SLC this year”. The news continued the results can be viewed online at www.soec.gov.np, www.moe.gov.np and www.doe.gov.np. 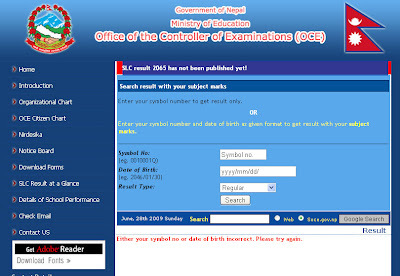 I rushed to my room and connected to the internet, to my surprise and utter dismay SOEC.com.np said “SLC result 2065 has not been published yet!” but still I punched in her symbol no. and the result was nothing. It was so slow I had to open the website in Chrome, trying over the same thing again and again I found out there was an unexplainable error. 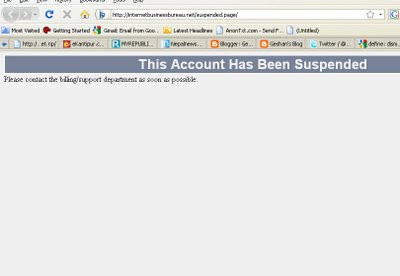 It was simple overload and I got a not found error in result.php. 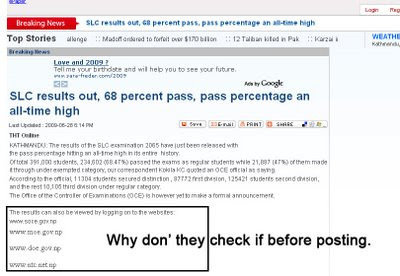 And yes MOE and DOE do not have SLC results or even the word SLC 2065 on their home pages. But again they did not check the sites and wrote “The results can also be viewed by logging on to the websites: ” I guess they forgot to write “After some hours” in that line. Another news told you can listen to the result Dialing 1600 on a land line and it said the result in not yet published. Man I had not tried this hard to know my own SLC result, I was lazying on my bed as at our times it was published in the morning 5 AM ;). Now already frustrated I checked twitter, after Michael Jackson people were tweeting about it but no one new an answer how to get the results. Why “shout out loud” in media before the result is published. Why is there no concept of load balancing on these sort of high traffic and high priority things. @bibstha man it must be done, lets do it. There were 3 alternative sites none had a thing www.slc.ntc.net.np said ” SLC 2065 Result will be available here as soon as it is published officially- Thank you”. The SMS thing and dialing 1600 was on no use. Don’t publicize things that you have not tried. In result publishing make it a single/multiple text or HTML file where one can search easily not a database request just because in our system it times out. Let the results of SLC be available via multiple servers or great load balancing 3 lakh 91 thousand is a very big number if around 30 % view results online its more than 1 lakh 17 thousand. Use technology so that people have faith on it, not one that does not work when needed and people hate it. And Yes if you need the result get the raw txt in zipped format at : https://files.getdropbox.com/u/547169/slc2065result.zip thanks to @jwalanta and also at http://ioelive.com/slc2065. I don’t know why I wrote this as this is a sheer waste of time, nothings going to change. But if someone reads this and can bring in even a small change I would be happy.